← Acrylic Painting by Numbers set. 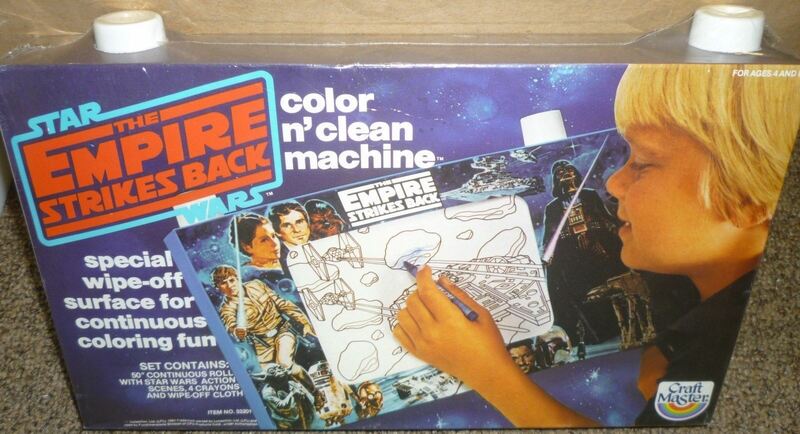 Looking at the photo of the rear of the painting by numbers box, i noticed that there was something called a Color n’ Clean machine. A quick search led me to one that was for sale on ebay by Mrsbeestrunk for $107.00. The box itself contains images on a 50″ roll that can be colored in and then wiped clean to be recoloured again. There are a few images that are on a spindle, so once you have finished with one, you turn the spindle to another picture. Even in the 80’s i can imagine that this would get boring pretty quickly. We can see the Millennium Falcon being chased by Imperial Tie Fighters in the asteroid field on the front. 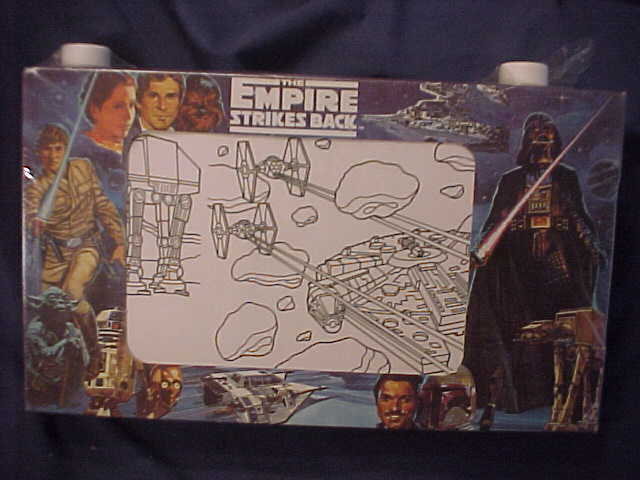 The back shows Darth Vader and what appears to be part of IG88. The Star Wars Collectors Archive has a photo showing another scene of the Hoth Battle. My friend Mike has one and he thinks that i should wait it out as they are known to come along for better prices. This entry was posted in Things that i don't have yet..., Vintage and tagged Millenium Falcon, Millennium Falcon, Star Wars. Bookmark the permalink.